After I played Strandhill in Co. Sligo, in October 07, I was interviewed by Mark Whorley for the Sligo Weekender newspaper. 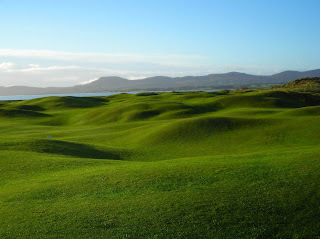 Strandhill is a super links course that rarely gets mentioned next to Rosses Point. It has a great history too, as the course was designed by the members and maintained by one of them using a tractor - photo is of the 5th hole. It is creative and entertaining, and now that new land has been purchased behind the 4th green, the weaker holes (9 to 11) can be replaced. If you come as far as Rosses Point then it would be criminal not to pop over the water for a round here.